Social learning in action: Participants at an AgKnowledge Share Fair in Ethiopia in May 2015 reflect on the event and its process (photo credit: ILRI/Liya Dejene). This quote is from a briefing note by the Climate Change and Social Learning (CCSL) initiative of the CGIAR Research Program on Climate Change, Agriculture and Food Security (CCAFS) involving as key partners the International Institute for Environment and Development (IIED), International Livestock Research Institute (ILRI) and the Collaborative Adaptation Research Initiative in Africa and Asia (CARIAA) program. 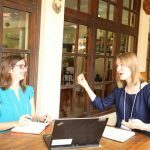 In May 2015 two members of the CCSL team were invited by ILRI to explore the question of whether and how research to sustainably intensify farming systems can benefit from these kinds of collaborative and iterative social learning processes. The exploration was undertaken through a review of literature and interviews with scientists from the Ethiopia Africa RISING team. The aim was also to contribute some ideas on what could be done to strengthen social learning in the program. 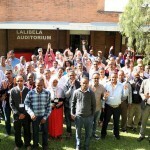 Africa RISING (Africa Research in Sustainable Intensification for the Next Generation) in Ethiopia is led by ILRI in a partnership with the Government of Ethiopia, other CGIAR centers (IWMI, ICARDA, ICRAF, CIAT, ICRISAT, CIP, CIMMYT) and many local partners. It works in eight Kebeles (local administrative areas) in four regions – Amhara, Oromia, SNNPR, and Tigray. 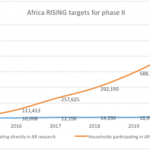 It is too early in the process of Africa RISING implementation to expect to hear about significant examples of change happening at scale, although we noted that scaling up to watershed levels is planned. During interviews with two of the participants conversation turned to the earlier RIPPLE project, since they had been involved it it. There are fascinating cross-overs – and examples of social learning – between the two projects. Both projects have at their core a series of collaborative, networked learning processes and platforms. And over RIPPLE’s five years, there is evidence of the kind of iterative learning leading to change at scale. For example, over time, discussions that started around specific water installations widened to address the impact of tapping springs for water supply on traditional multi-use practices and then further extended to include other stakeholders and ministries on wider natural resource management issues such as how to address the drying up of streams and reforestation. The interviews surfaced two potentially significant challenges. First, the innovation platforms method has come up against process constraints related to the particular political economy of Ethiopia. This is most evident in the risk of bureaucratic capture of the dialogue space when government actors act as platform chairs / facilitators but do not encourage formal or informal group formation or discussion beyond exciting governance arrangements. 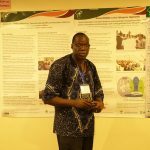 Second, the annual learning reviews within Africa RISING have been face to face events that do not include the perspectives of all actors in the program (other approaches like most significant change stories are being used to try and widen the learning) and they do not provide strong enough incentives to act on lessons that emerge. Monitoring the extent to which beneficiaries define future research questions to support a wider basket of innovation options.